This array of powerful, fast-acting Cybersolv and KYZEN branded products is specifically formulated for your process maintenance needs such as degreasing, circuit board defluxing, bench top cleaning, wave solder pallet cleaning, reflow oven maintenance, maintenance tank descalers and defoamers. Routine maintenance is a crucial part of ensuring a reliable, high-yield production processes. In today’s time-pressured work environment, scheduling those maintenance activities are often a challenge because most require taking that machine off-line and interrupting valuable production time. You need advanced cleaning technologies and agents that not only work fast but are easy to use and safe for personnel and the environment. KYZEN’s innovative approach to developing and supplying environmentally friendly industrial cleaning solutions designed for the maintenance and tank conditioning of your process equipment has earned them global leadership in their industry. KYZEN understands that successful business for you (and us) goes beyond just helping produce residue free electronic assemblies; rather it’s about optimizing your process yields, minimizing downtime and working safely with minimal waste and environmental impact. In many cases, this process optimization starts with making sure your equipment is operating properly. • Reflow processes where flux build-up can disrupt your profile and lead to re-deposition i.e. reflow oven maintenance. • Wave and Selective Soldering applications where pallets and fingers are repeatedly exposed to flux build-up such i.e. 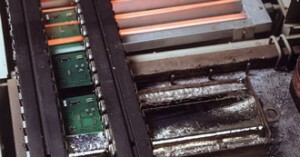 wave solder pallet cleaning and circuit board defluxing. o Defoamers for flux residues, like some water soluble materials, that have natural propensity to create foam. KYZEN’s experienced technical staff provides friendly on-site support and process audits to help review your unique process and support your maintenance program. If the equipment isn’t operating at peak efficiency then your yields are likely suffering. KYZEN’s unparalleled combination of proven maintenance products, process knowledge, and friendly support staff are here to help. Cleaning processes can go astray with even the closest of monitoring. Process condition remedies by “Tank Conditioning” or improving the wash tank solution is, in many cases required due to extremes in soil loading, quality of water and the requirement to exposes sensitive or intricate components to the flux cleaning wash process. Wave soldering is a commercial soldering process where important parameters are controlled and high throughput rates can be achieved. Technical knowledge of the components, PCB and the parameters of the wave solder machine itself is important to achieving a successful soldering process.